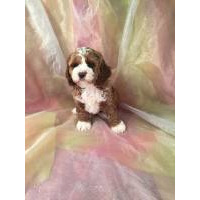 • Cockapoo dog breeders are listed below alphabetically by State / city. • Click on underlined words to see their Cockapoo puppies for sale. • Please tell the Cockapoo dog breeders with puppies for sale that you found them on BreedersClub.net. The popular hybrid breed, Cockapoo, is a mix of American or English Cocker Spaniel and Poodle. Cockapoos are small dog with low minimal coats of various colors. They are generally outgoing, affectionate and loving, and quite intelligent and exhibit energy that requires regular exercise. All our pups are home raised with children, and exceptionally well socialized. Current shots & wormed; Health guaranteed; Parents on site. I give all shots and worming up to date. I give a health guarantee. I have been breeding 20 years. I have a very nice and helpful vet. I do not sell a puppy under 8 weeks. I also rescue and help others. I do ship puppies. My family and I love animals, and we also have a few rescued animals (birds and a donkey). We believe in the unconditional love they provide, therefore they are raised in our home. We raise cockapoos for the passion that we have for them, and they make fantastic therapy companions. All my animals receive regular vet checks, and vaccines. We offer (1) year health guarantee and we are available 24/7 for questions or advice via text, email, and phone. Puppies can be delivered for a fee round trip and we will only allow them to fly first class or coach. We are a small family breeder located in Manawa, WI specializing in First Generation puppies. We generally have puppies available throughout the year, both males and females, in a large variety of colors. All puppies come home up to date on their vaccinations, vet checked, de-wormed, and also with a health guarantee. We do also offer shipping throughout the United States. Description: The Cockapoo is relatively new American breed, a cross between the American Cocker Spaniel and Poodle. Their coats are curly and dense, the tail is long and close. Cockapoos do well living in apartments but are fairly active -- a small yard for romping is good for them. They prefer cool climates. The Cockapoo is good with children and other dogs, easy to obedience train. This breed is recognized by the Continental Kennel Club but not by the American Kennel Club which requires many years of breeding to meet their guidelines. Maxi - over 19 pounds. 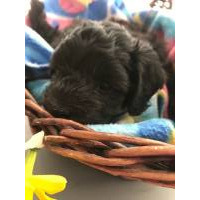 This breed directory page features Cockapoo dog breeders with puppies and/or adult dogs for sale. Once you purchase your new found friend, you will want to provide it the best in pet health care. Be sure to visit our online discount pet supplies catalog and order NuVet Plus™ to keep your puppy and adult dogs in top condition. The discount catalog also features collars, leashes, carriers, general pet care products and much more. BreedersClub.net does not pre-screen the Cockapoo dog breeders who advertise their puppies and dogs for sale in the BreedersClub.net breeder directory and in the classified ads. We require all advertisers to agree to our advertising terms. You should ask the Cockapoo dog breeders you talk with for references from past buyers and veterinarians.